Stamp with Melva: Here it is September already! Where does the summer go! It has been a very hot and dry summer here on the West Coast and suddenly and with a vengeance, fall arrived last week. I can't really complain as we really needed the rain, but I wish it could have been a little more gradual! 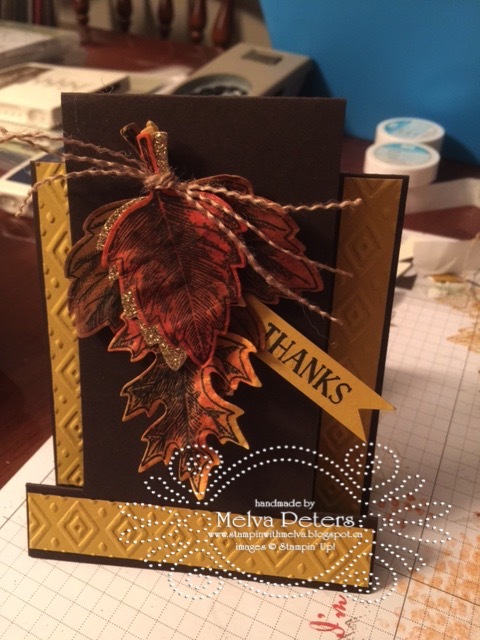 On that theme, I'm sharing a couple of "Fall-ish" cards. Both cards use a mix of products from the Annual Catalogue and from the Holiday Catalogue. I made this card with a new stamping friend. Chris came over the other night to learn more about stamping and to "play". It was nice to just sit down and make a card together and to get to know her a little bit better. 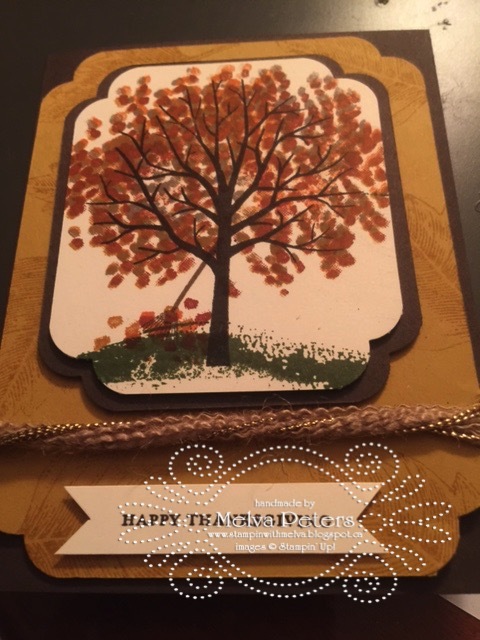 This card using the Sheltering Tree stamp set as well as the Vintage Leaves stamp set. For the ribbon embellishment, I cut the edge off the Burlap Ribbon and pulled some of the threads off. Then I took some gold cord trip and twisted it. I like how it turned out. I also love the Curvy Corner Trio Punch - 3 different shapes on one punch. I absolutely love the Vintage Leaves stamp set and coordinating framelits. I think they are my favourites from the Annual catalogue. I cut out different leaves from Delightful Dijon, Crumb Cake, Pumpkin Pie and Gold Glimmer paper. Using the same mixture of colours I sponged the cardstock leaves, then spritzed with alcohol and scrunched them. I attached them to a step card after tying them together with some burlap threads. I used the Boho Chic Embossing folder to add some texture to the rest of the card. Interested in learning how to make the Step Card? This card will be featured at one of my Card Classes this fall. Email me to learn more. If you haven't received your Annual or Holiday Stampin' Up! catalogues, Email me and I'll make sure you get one.